Relationships come first – We strive to build productive relationships with all stakeholders during every interaction. Everybody matters, all the time – We are an inclusive community where the needs and well-being of all people are paramount. We act with integrity – People and decisions are guided by the best interests of our learners, our community and our society. We learn from each other – Everybody’s voice and contribution has value. We work hard – Because the future lives of our learners depend upon what we achieve. Pupil premium is additional funding to the delegated school budget which the schools receive for disadvantaged (free school meals) pupils. 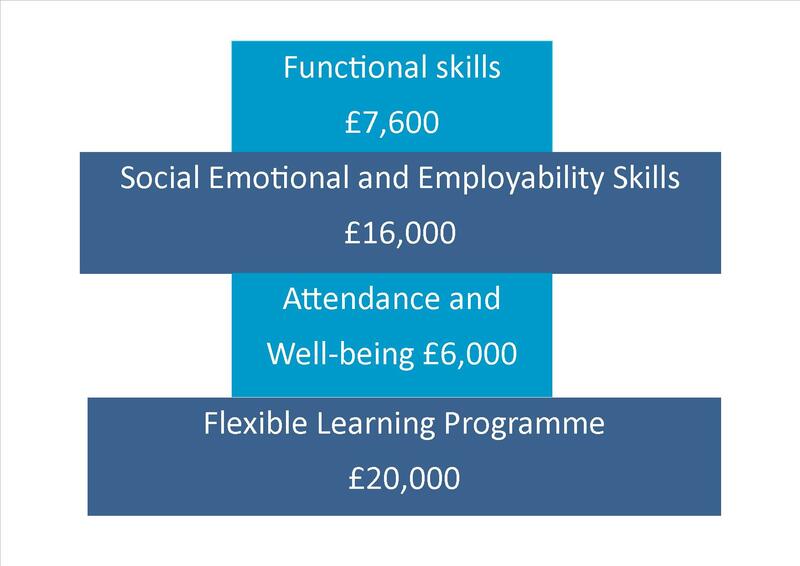 Schools are required to use this funding to narrow the disadvantage gap by addressing inequalities and raising the attainment of those students in low-income families. To learn pro-social skills through positive behaviour management techniques liked to regular reward tips. Good or better ELT scores in all subjects for PP pupils. % of pupils earning trips gradually increasing. Diminish gap to the national average attendance. Attendance To improve attendance of children in receipt of PP using school based interventions such as parenting support or communicating with parents through letters or meetings, and to celebrate good attendance throughout school. £2000 Diminish gap to the national average attendance. To provide diagnostic assessment and planned targeted interventions for pupils underperforming in literacy and numeracy. Diminish the literacy and numeracy ARE gap for PP pupils. Catch up premium reading scheme To provide a reading catch up scheme and online platform to engage and track pupils reading progress. £1200 Diminish the literacy and numeracy ARE gap for PP pupils. Enrichment To be able to access after school clubs and curriculum tips that enriches the curriculum and fosters engagement in learning. 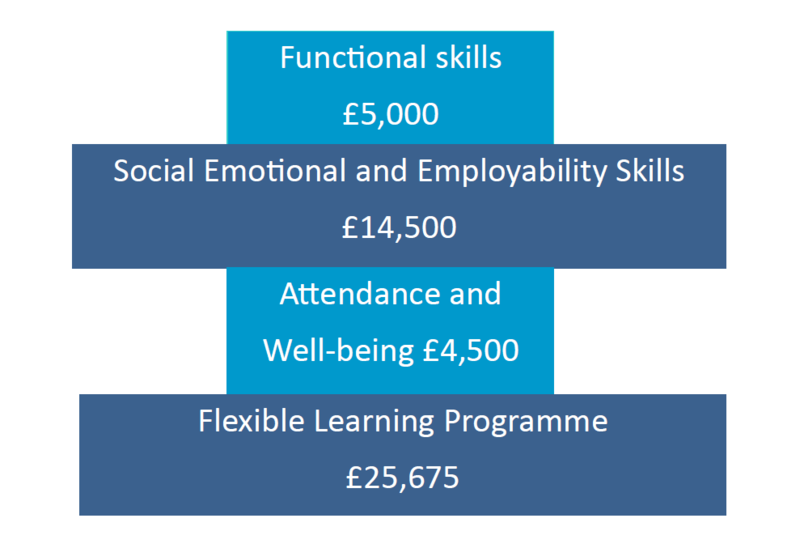 £3700 Increase aspirations of deprived pupils. Foster independent like skills such as traveling on public transport. IT equipment To provide tablets computers for to engage pupils in online literacy and numeracy tools. £1500 Increased engagement in online literacy and numeracy tools in school and at home. Diminish gap to the national average attendance for FLP pupils. Engage pupils who are de-schooled back into education. Life Skills To enable pupils to learn cooking skills and know how diet is linked to a healthy lifestyle. To provide pupils with support e.g. escorted visit’s to college so that they feel comfortable and have the require support in their new setting. To provide pupils with opportunities for extended work experience placements. £2540 Reduced NEET figures. Pupil Premium funded small groups and 1:1 tuition with the Flexible Learning Programme (FLP) staff for 21 pupils in 2017-18. Sixteen of these pupils joined Kilgarth late in their school careers. Difficult to engage or at risk of permanent exclusion from other schools, they would not have accessed secondary education at KS4 without the FLP. All of these pupils were transported to and from school or their vocational provider by FLP staff who also offered support on a daily basis. This resulted in attendance for Y11 FLP pupils of 70.9% and Y10 FLP pupils 83.88%. Attendance across the whole school stands at 81% at the time of writing. All FLP pupils had access to a range of accredited qualifications, including GCSE English and Maths, L1 and L2 vocational courses of their choosing and functional skills. Pupil Premium funded small groups and 1:1 tuition with the Flexible Learning Programme (FLP) staff for 22 pupils. Ten of these pupils joined Kilgarth late in their careers. Difficult to engage or at risk of permanent exclusion from other schools, they would not have accessed secondary education at KS4 without the FLP. All of these pupils were transported to and from school or their vocational provider by FLP staff who also offered support on a daily basis. This resulted in attendance for Y11 FLP pupils of 76.3% and Y10 FLP pupils 68.4%. Attendance across the whole school stands at 81.3% at the time of writing. All FLP pupils except one gained at least one qualification as a result of their academic study and vocational training. 27 pupils received regular monitoring, counselling or both to help with a variety of SEMH issues. The school’s reward based, no sanctions approach to behaviour modification saw exclusion rates maintained at the previous year’s lower level – a fall of 18% since 2014/15. 30 pupils attended vocational placements on a daily or weekly basis. They were all transported to and from the providers, often picked up from home. All of our leavers gained at least one qualification as a result of their vocational programme or input from our Flexible Learning Programme. 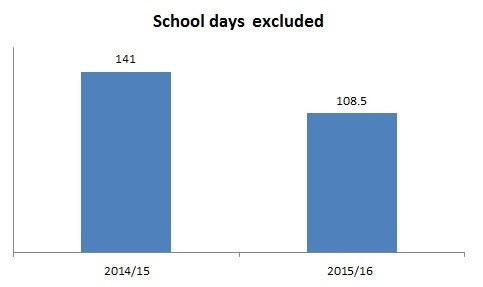 Exclusions reduced as a result of our newly developed system for behaviour modification and management – from 141 days in 2014/2015 to 108.5 days in 2015/2016. 35 students benefitted from mentoring, counselling or both. 18 students benefitted from assessment and planning from the Speech and Language service. 7 students received one to one intervention to improve their basic skills. A member of staff was allocated to support students in challenging circumstances get to school each morning; this resulted in an improvement in attendance for this group by 2%, and one pupil’s attendance increased by 28%.